Cemeteries, no. 17: the Littleton and Judie Ellis family. 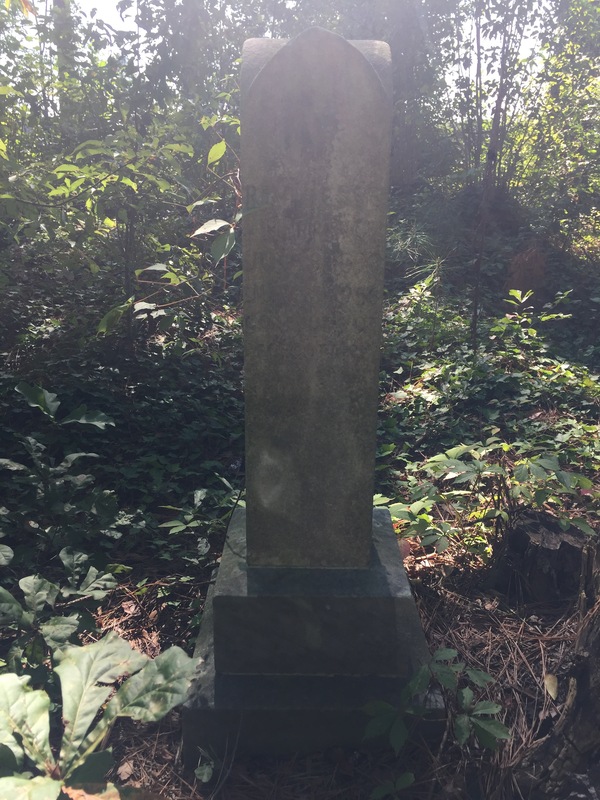 This small family cemetery is completely hidden in a copse of trees just outside the gates of Wiggins Mill Water Treatment Plant on Forest Hills Road in Wilson. Until relatively recently, this area — nearly four miles south of downtown — was outside city limits. 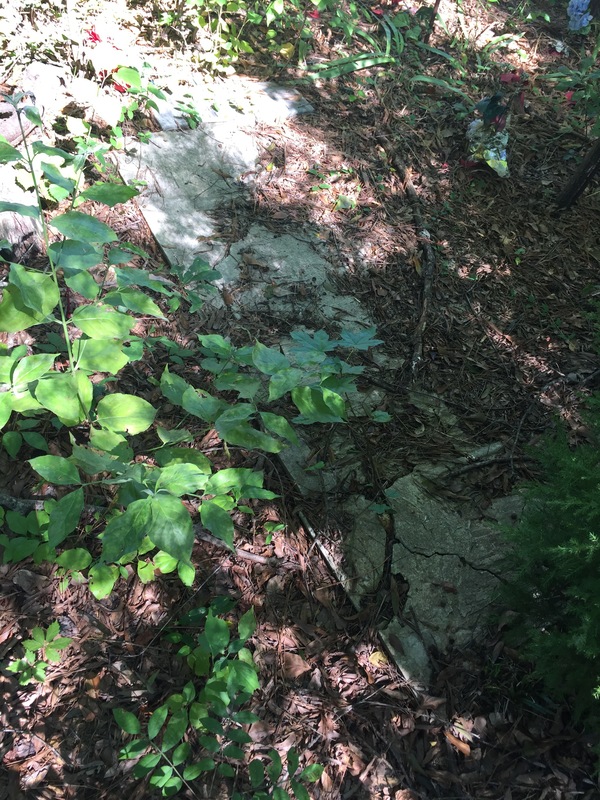 Few gravestones are visible in the tangle of catbrier, pines and oak saplings, but several oblong indentations — some feet deep — mark burial sites just as clearly. 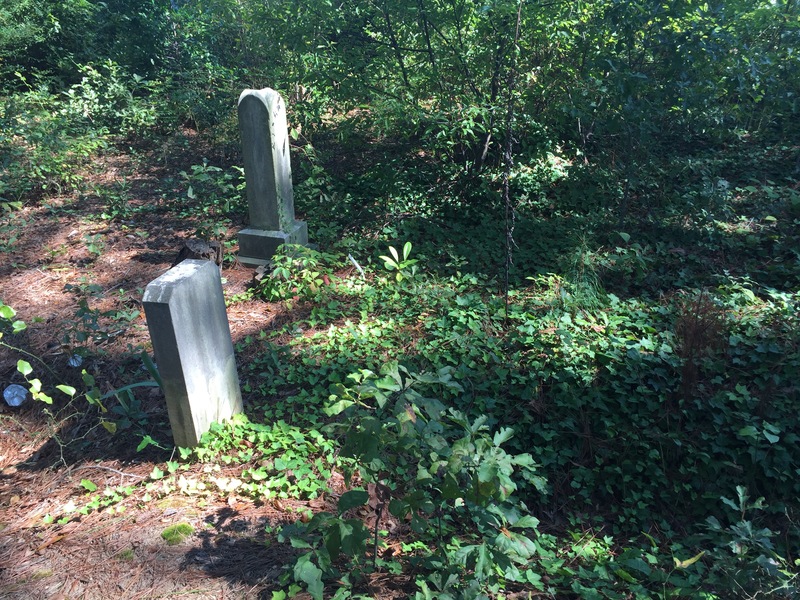 This cemetery holds the remains of several generations of the family of Littleton and Judy Barnes Ellis, a couple born in slavery. 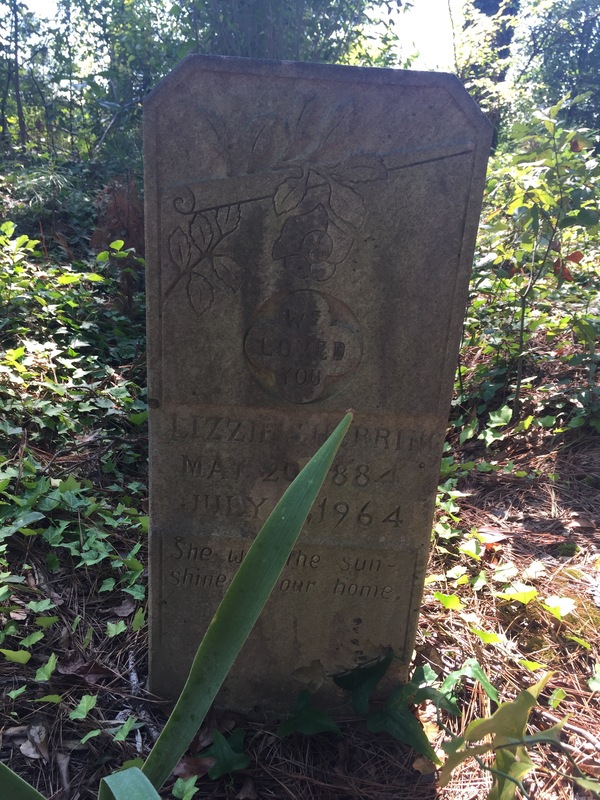 The couple and at least four of their children — Bryant, Lucy, Maggie, Lizzie Sarah — are buried here on land that once belonged to Littleton Ellis. Maggie Ellis Darden (1886-1969). Gone to take her rest. We loved her but God loved her best. The family. In the 1870 census of Stantonsburg township, Wilson County: farm laborer Littleton Ellis, 30, wife Judah, 21, and children Bryant, 4, and Martha, 3. In the 1880 census of Stantonsburg township, Wilson County: farmer Littleton Ellis, 45; wife Judah, 30; and children Bryant, 14, Martha, 12, Patsey, 10, Mary, 8, Bud, 6, Thomas, 4, Rose, 2, and James, 1. In the 1900 census of Wilson township, Wilson County: farmer Littleton Ellis, 73; wife Judy, 55; and children Lucy, 21, Littleton, 18, Sarah, 16, Maggie, 14, Nettie, 12, and Minnie, 10. In the 1910 census of Wilson township, Wilson County: on Wiggins Mill Road, farmer Littleton Ellis, 27; his mother Judie, 62; and sisters Lucy, 30, Sarah, 24, Maggie, 23, and Lettie, 21. In the 1920 census of Wilson township, Wilson County: farmer Judie Ellis, 80, widow; children Lucy, 32, Litt, 30, and Maggie, 25; and granddaughter Manerva Barnes, 22. On 18 March 1923, George Darden, 35, married Maggie Ellis, 25, in Wilson County. Free Will Baptist minister Tom Thomas performed the ceremony in the presence of Willie Darden, Jonathan Ford, and W.H. Cotton. In the 1930 census of Black Creek township, Wilson County: farm laborer George Darden, 42; wife Maggie, 35, and daughter Artelia, 1. In the 1940 census of Wilson, Wilson County: at 1021 South Mercer Street, laundress Maggie Darden, 46, and daughter Artelia, 11. 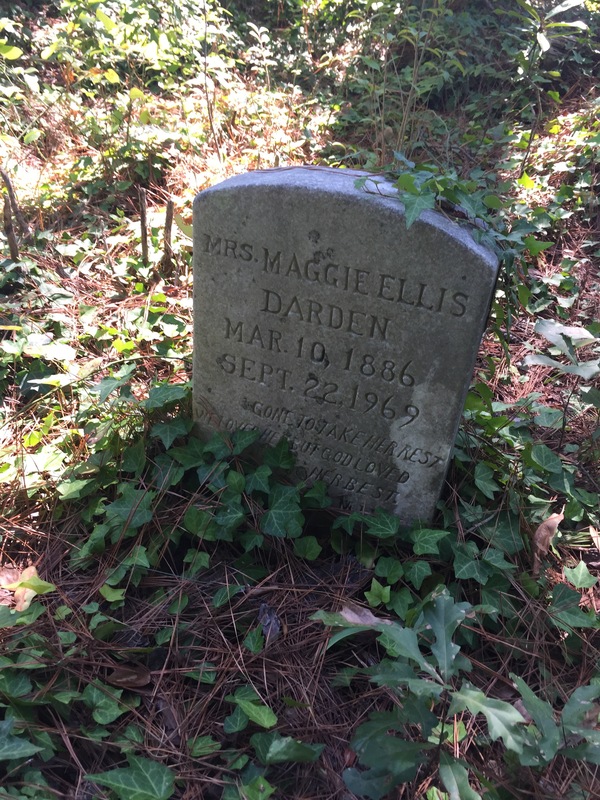 Maggie Ellis Darden died 22 September 1969 in Wilson. Per her death certificate, she was born 10 March 1886 in Arkansas to Littleton Ellis and Julia Barnes [were the Ellises returned Exodusters?] Informant was Artelia Neal. Rev. Jesse Herring (1890-1956). Gone but not forgotten. In the 1900 census of Indian Springs township, Wayne County, and the 1910 census of Brogden township, Wayne County, Jessie Herring is listed in the household of his parents Amos and Lucy Herring. In 1917, Jesse Herring registered for the World War I draft in Wilson County. Per his registration card, he lived at 618 Lodge Street, Wilson; was born 23 September 1892 in Mount Olive, North Carolina; worked as a carpenter for George Whitley in Wilson County; and had a dependent wife and two children. In the 1920 census of Wilson township, Wilson County: at 413 Lodge Street, carpenter Jessie Herring, 27; wife Sarah, 33; and children Daisy, 5, Minnie, 4, and Mary, 2. In the 1940 census of Wilson township, Wilson County: on Highway 301, farmer Jessie Herring, 53; wife Sarah, ; and children Dazel, 25, Amos, 20, James L., 14, Mary Elizabeth, 9, George R., 7, and Ruby Lee, 6. Herring owned his house. Jessie Herring died 5 June 1956 in Wilson County. Per his death certificate, he was born 23 September 1889 in Wayne County to Amos Herring and Lucy Whitfield; was a farmer; was married to Sarah Herring; and was buried in Ellis cemetery. Sarah Herring was informant. Lizzie Sarah Ellis Herring (1884-1964). We loved you. She was the sunshine of our home. ← Studio shots, no. 41: David Creech. Thank you. Jessie and Sarah Herring were my grandparents. Mary Elizabeth was my Mom. I visited the cemetery a few years ago when it was cleared. Your information filled in the gaps. Wow! It’s amazing how time flies! I’m the great great grandson of Littleton Ellis. And I have many questions I want to ask. My email address is hinesclifton720@gmail.com. I’m looking forward to any and connections.